In mid-December 1944, Jim Layton (Marshall Thompson) reports to a platoon in the 101st Airborne Division as a replacement, but is ignored by the veterans. Eagerly looking forward to a three-day-pass to Paris, the men suddenly learn that the Germans had made a breakthrough somewhere, so they are sent to fill the gap. The news is not welcomed by Pop Stazak (George Murphy), the oldest member of the platoon, who is about to be sent back to the US to take care of his family. 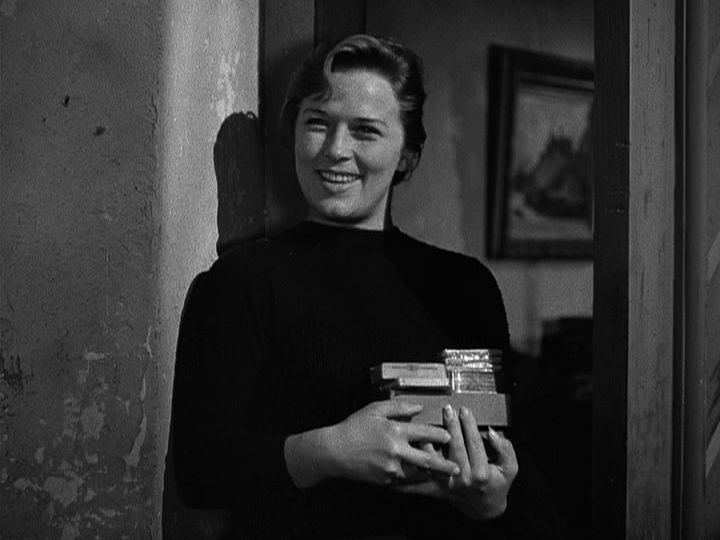 Arriving at Bastogne, the platoon enjoys a friendly welcome from the charming and shapely Denise (Denise Darcel), who opens her home in exchange for chocolate and cigarettes. While the men are asleep, one of the guards encounters exhausted soldiers coming back from the front, retreating through the town with stories of an unstoppable wave of Germans. Learning that German soldiers are pretending to be American, paranoia spreads, and patrols ask strangers questions about American trivia. After several days of fighting, the men are told that Bastogne has been surrounded. Since cloudy weather prevents aerial drops of supplies, the men start running low on food and ammunition. 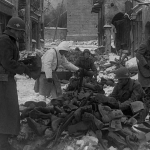 Despite the hardships, the soldiers are pleased when they learn that the commander of the American troops at Bastogne refused the Germans’ demand that they surrender. 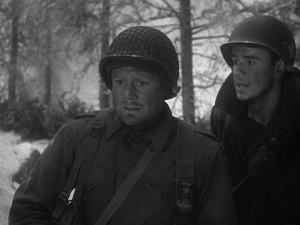 Robert Pirosh, the screenwriter, had fought in the Battle of the Bulge as a member of an infantry division, so the script captures the perspective and confusion of the soldiers. Throughout the film, the men have no idea what is going on. Their world has shrunk to their company. One of the soldiers finally explains that Bastogne is important because it is a road junction that leads to Antwerp. The men read about the Battle of the Bulge in the Stars and Stripes, the army newspaper, but are not sure if they are in Belgium or Luxemburg. 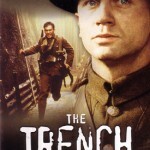 Unlike the patriotic war movies produced en masse by Hollywood during WWII, the film is an honest look at the war, portraying the soldiers as human beings with faults. While it may seem rather tame today, it was remarkably gritty at the time. Battling fever and frostbite, the men constantly grumble and dream of wounds that would send them home, but they endure and continue to fight. 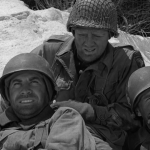 Private Holly (Van Johnson), the best scrounger in the platoon, has tried to avoid responsibility but has to take over when the sergeant is badly wounded. Recognizing the danger of the situation, Holly starts acting like a sergeant. Meanwhile, Layton follows Holly’s example and becomes a scrounger, always looking for an angle. While the movie was ahead of its time because of its realistic portrayal of soldiers, it was still made in 1949, so the men’s carnal urges are toned down. The men are eagerly looking forward to three days of leave in Paris, when they learn they will be sent to stop a German breakthrough. Actually, the real soldiers had already started their leave, so the MPs had to scour the bars and bordellos of Paris to find them. Denise is remarkably cheerful, even though she has to care for two children who were orphaned during a bombing raid. Whether the gratitude was genuine or not is unknown, but she did grab as many chocolate bars and packs of cigarettes as possible in exchange for her hospitality. Unimpressed with Denise’s friendly attitude, one of the paratroopers resents all of the Europeans, saying they are only friendly if you give them cigarettes and chocolate. While it is true that the turning point in the battle occurred when the weather improved, enabling planes to drop supplies for the troops in Bastogne, the script goes overboard when it shows that the troops immediately counterattacked after receiving supplies, and had driven off the German attackers before Patton’s tanks reached Bastogne. In reality, the supplies simply enabled the men at Bastogne to hold on until Patton’s tanks broke through the Germans surrounding the town. In most war movies, foxholes magically appear but a great scene shows how long it takes to dig a foxhole, while the film repeatedly reminds viewers that sleeping in a foxhole during a snowstorm is far from comfortable. While English-speaking German soldiers did masquerade as Americans, it was a small operation and it only took place in another part of the front, not at Bastogne. 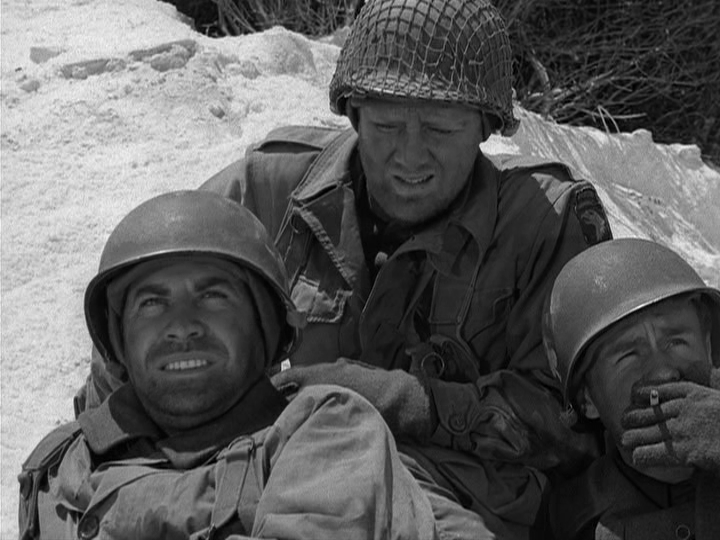 However, the scene where soldiers from different units quiz each other about baseball trivia is an accurate portrayal of the paranoia that spread through the American army. At one point, military intelligence feared that the infiltrators planned to assassinate General Dwight Eisenhower, supreme commander of the Allied forces in Europe, so he was placed under strict security, until he became fed up and dismissed his over-enthusiastic bodyguards. 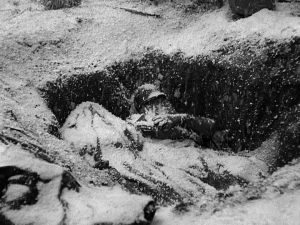 Shortly after the platoon reaches Bastogne, Layton finds out that his buddy, a fellow replacement who was assigned to a different company, had died the night before. Stunned that the men in his platoon do not even know his friend’s name, Layton obsessively informs everyone he serves with his full name until he is finally accepted. By that time, he has become as unshaven and bitter as the veterans. As the battle continues, the men become too tired to complain, and focus on survival. 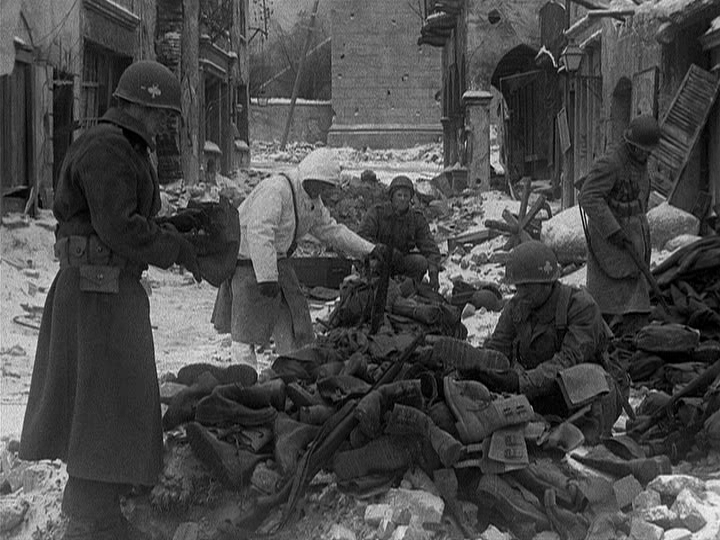 Near the end of the siege, the survivors look through piles of gear from dead soldiers for coats and goulashes that fit. Meanwhile, civilians root through garbage cans for leftovers. Producer Dore Schary had purchased the rights to the story despite the misgivings of Louis B. Mayer, head of MGM, who believed that the public had lost interest in war films. 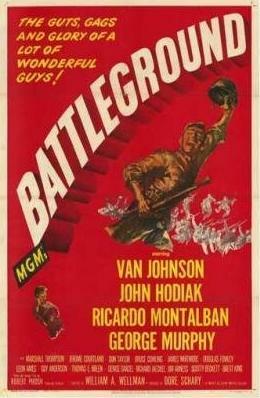 Schary was proven right, and Battleground was the studio’s most profitable film that year. Director William Wellman had flown with the Lafayette Corps during WWI, and directed Wings (1927), which was the first film to win the Academy Award for Best Picture. Although he was an airman at heart, he clearly understood infantrymen, since he made an excellent film. 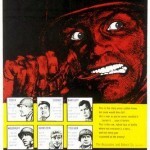 Twenty members of the 101st Airborne were used as extras. They were put through acting boot camp. The film won Oscars for Cinematography and Original Screenplay (Pirosh). It was nominated for Picture, Director, Editing, and Supporting Actor (James Whitmore). You are right about the emphasis on the “fog of war”. At one point a soldier laments that his wife back home probably knows more about the battle than they do. This movie is ranked #36 on Military History magazine’s 100 Greatest, but I think it is overrated. I would give it only a B-. You are right that the combat is underplayed, although when I read about the battle, I think it was in Toland’s book, men complained about the cold and the confusion. But yes, a few more combat scenes would have improved the movie, especially if they had eliminated the annoying montage at the end, which looked like the budget ran out. #36 seems more generous than the film deserves, although I think it should be a contender for the top 100. Looking forward to seeing your list when you finish making your way through the official list. In a contrary view, I despised this movie as a particularly egregious example of what one film researcher labelled `combat genre’ films; they are deliberately historically inaccurate because their objective was to fulfill the old familiar Hollywood mandate, to entertain. They also served the useful purpose during the war of masking the true horrors as well as the almost unbelievable bravery of many of those fighting men. As a result, ;this movie is just a corny sequence of one bad thing after another. In addition to the ubiquitous tale of soldiers chasing tail, it features stupid vigniettes like van Johnson trying to scramble eggs in his helmet.. 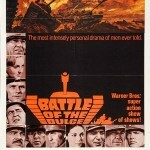 Compared to many contemporary superb films about WW 2 (e,g, Band of Brothers, Pacific etc.) which really accurately portray the horrors and magnificence of war and ultimately stand as appropriately worthy testimonials to the guys who ultimately defeated Facism, this is a stupid, boring film. I agree that it can not be compared to Band of Brothers but it is pretty good for the time, especially since it was one of the few to show soldiers griping.